"I was working in the Laab late one night..."
If you've been reading my contributions for any significant stretch of time, you'll know that I don't usually subscribe to the concept that "simplest is best". I like to complicate things and throw more stuff into a recipe than might make sense. But sometimes I come across a dish whose strength lies in its (relative) simplicity. One such case is a Loatian/Thai staple called "Laab" (or "Larb"). 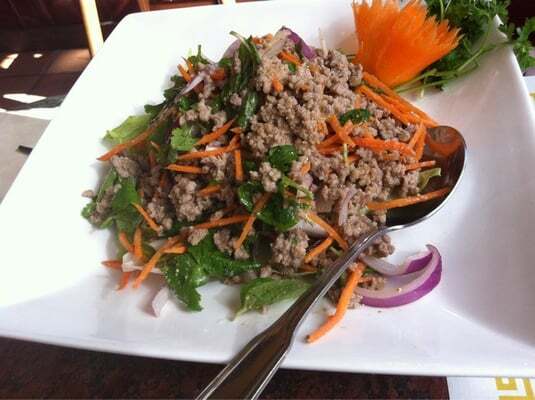 Laab is, essentially, a salad of ground pork or beef mixed with shallots, fish sauce, lime juice, herbs and a couple of other ingredients. I first tried it at Play where it was served on lettuce wraps, and I was hooked. It can be served hot or cold, raw or cooked (I recommend the latter) and presented pretty much any way you like. As I said: simple. The flavour profile highlights a few of the cornerstones of Southeast Asian cooking, namely the uniquely funky saltiness of fish sauce, the tart sweetness of lime juice and the herbal notes of mint, cilantro and/or Thai basil. And that's just the basic model. So, today I'll be walking you through the how-to on this delicious and easy bit of gastronomy! - Mix meat well with shallots, garlic, ginger, juice and zest of half a lime, 2 tbsp of fish sauce, brown sugar, sesame oil, and sriracha. Let stand in fridge for at least an hour to let flavours mix. - Toast the rice in a frying pan for about 5 minutes until golden brown. Grind rice into a coarse powder in a mortar and pestle or in a spice grinder. Set aside to cool. - In a large frying pan, cook meat for 10 minutes until well cooked through. Set aside to cool for a little bit until it's warm, but not hot. - Stir in whatever herbs and veggies you like (I went with mint, cilantro and carrot the last time I made it), along with the remaining lime juice and fish sauce. - Serve on lettuce wraps or in a bowl or whatever you like! I love Laab so very much. It combines meaty richness with all the freshness of lime juice and herbs and veggies, with a little bit of an exotic crunch from the toasted rice. It's a fairly light meal, but still satisfying. I highly recommend you try your hand making it or at least finding a restaurant that serves it. I'm back with the second part of my examination of the art of smoking brisket. Last time we went to Texas, where slow-smoked brisket is the cornerstone of BBQ. This time our travels take us a bit closer to home, to la belle ville de Montréal where brisket has become one of the city's most recognizable culinary hallmarks in the form of Montreal Smoked Meat. Smoked Meat is to be found any of the dozens of kosher delis spread across the city and is renowned the world over. There's a bit of discussion on who invented the process, more than I have the time or inclination to get into (clearly! ), but currently most opinions point to Schwartz's as the best Smoked Meat, and I agree. Either way, Smoked Meat is pretty much one of the best, if not the greatest, of Canada's contributions to the global palette. As mentioned in a recent post, a good hunk of brisket is at least 40 bucks and you don't want to screw around with that much meat and ruin it. If you're like me, you take to the Internet for inspiration and guidance and then try to make the recipe your own. With the Texas Brisket, the instructions were fairly straight-forward, but flexible; with Smoked Meat, I wanted precision, I wanted to know how they do it at Schwartz's. Remarkably, a recipe from the deli itself was made available on the Food Network Web site, sort of. Those instructions were a bit over-simplified for my taste, so I kept looking around and was able to find a bit more information on a Big Green Egg forum. This gave me a bit more info on the actual procedure, but I had to come up with my own ideas on what to use to actually cure the meat. So, come with me as I get into this nigh two-week process of transforming a hunk of brisket into deliciousness. NOTE: Most restaurants and industrial producers use "pink salt" (sodium nitrate or nitrite) which gives the meat the uniform deep red/pink colour. I didn't, so the result had a colour more like roast beef, although the smoking process did impart a pinkish smoke ring which is to be expected. - Mix all ingredients together well. - Brush a thin layer of yellow mustard on the brisket, than apply the cure to the top and bottom of the meat, pressing a little bit to ensure it stays on. - Place the meat in a large Ziploc bag and put in the fridge for 9 to 10 days, flipping over twice a day. - Once the meat's been cured, remove from bag. - Rinse meat quickly then soak in cold water for about 3 hours, changing the water every 30 minutes. This step removes a lot of excess salt, which is important in the process of making Smoked Meat rather than Salt Lick. Pat meat dry. - The next day, remove meat from fridge and leave out while you prep the smoker. - Soak 2 cups of mesquite chips in water for about 30 minutes. Light your fire using lump charcoal or wood chunks (I suggest either apple or maple) and get a temperature of 250 Fahrenheit going. - Smoke brisket for 4 hours, adding small handfuls of apple or hickory wood chips every 30 minutes to produce more smoke (and more flavour). - At the 4 hours mark, wrap meat in foil and continue to smoke for another 4-5 hours. Remove meat from smoker, unwrap and let stand for 30 minutes. - Slice meat into portioned hunks depending on how much you want to eat at any given time. Now, you don't want to start digging in just yet, as the meat needs one more step before actually serving it. If that's now, then get at it! - Steam hunk of meat for an hour. I used a bamboo steam basket over a pot of boiling water. Line the basket with a layer parchment paper and place meat on top, cover with lid and steam. - Once steamed, remove with tongs, slice meat against the grain at desired thickness (I think about 1/4-1/2 cm is perfect) and serve on warmed slices of rye bread topped with mustard, with a side of pickles, fries and coleslaw. NOTE: If you're lucky enough to have access to it, ALWAYS use Rideau Bakery rye bread. You just put all this love and care into making Smoked Meat, it's what it deserves. As you might ﻿have noticed from the picture, I portioned this batch into three pieces, each one being enough for two satisfyingly meat-laden sandwiches. What was interesting about it was that the first serving, which I ate right after smoking and steaming the meat, didn't quite taste as much like Smoked Meat as I had hoped, there was a bit of a pot roast undertone to it. Buy the time I got to the last hunk about a week later, however, it had become a really good approximation of the Schwartz's flavour profile. So I think a bit of post-smoked aging for a few days to a week is your best bet. The steaming is an important step also, as it gives the meat the moisture it needs to be melt-in-your-mouth. Now, with the Texas Brisket, I used it in all kinds of different ways, but the Smoked Meat was purely for sandwiches. That being said, I'm sure it would be spectacular in an omelette, or even spaghetti! Ah, who am I kidding? Make sandwiches with it, any other usage feels a bit like sacrilege. And in the end, maybe because I followed directions better or maybe because I'm geographically biased, the Montreal Smoked Meat gets a 9 out of 10, edging out the Texas BBQ to win the "Battle of Brisket". Vive la Viande fumée! Boy howdy did I have fun with this! Here's hoping you do too! As you well know, I've become a bit of nut about smoking meat over the past 4 years, ever since I first tried my hand at ribs. Since then I've done fish, pulled pork, shrimp, veggies and many, many more. But there's one particular staple of smoking and BBQ that I've been a little nervous about trying and that's beef brisket. First off, you can't do "just a little" brisket, you need to buy a pretty massive hunk of meat and it's hard to justify spending 40-50 bucks on a piece of meat you might screw up and turn into leather. Another important element to my brisket cooking reticence has been the fact that I don't know the style in which to cook it! Being only 2 hours away from Montreal, my experience with eating brisket has come mainly in the form of the Hebraic staple simply called "smoked meat", probably made most famous in Canada by Schwartz's Deli . 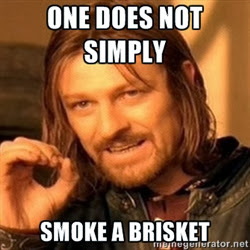 But over the years, I've had the chance to try the other most popular form of brisket, which is smoked barbecue style, most famously found in Texas. Both styles are absolutely over-the-top delicious if done well, but brisket's a risky piece of meat to work with. 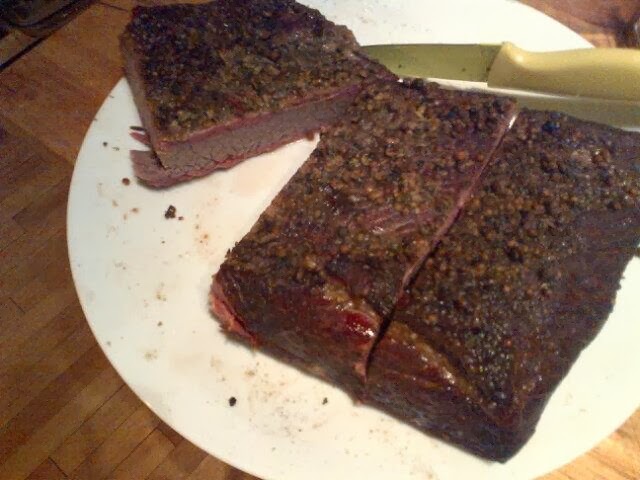 I've had Texas-style brisket that was the texture of sawdust and Montreal smoked meat that was like rubber. Not one to ever be able to make a simple decision, I decided to treat myself to a 10+ pound (or so) brisket and try cooking both Texas-style and Montreal-style. I cut the 10 pound piece in half, so for each recipe I'll be dealing with 5 pounds of meat. Now, to be fair, there's really little difference in how one prepares the brisket initially. Both involve a rub/curing process, both involve smoking, both involve a certain measure of rehydration when serving and both are used in a variety of ways, although smoked meat is most often found piled high between slices of rye bread, where it belongs. I scoured the Internet for recipes on both techniques; I've allowed myself to experiment willy-nilly with various smoked meatstuffs before, but this was a little more high-risk and I wanted to make sure I got off on the right foot. Today, I'm going to stick with the Texas Brisket, and cover the Smoked Meat in a later post. For the Texas Brisket, I found a bunch of recipes and adapted things as I went. There was one recipe from Bobby Flay that helped me approximate the rub time and heat to use, and I perused a few more for some other tips. But as I did my research, I found that the information was like most information off the 'Net: mostly useful but maddeningly contradictory. In the end, I wound up ad libbing the rub, albeit not the cooking process. 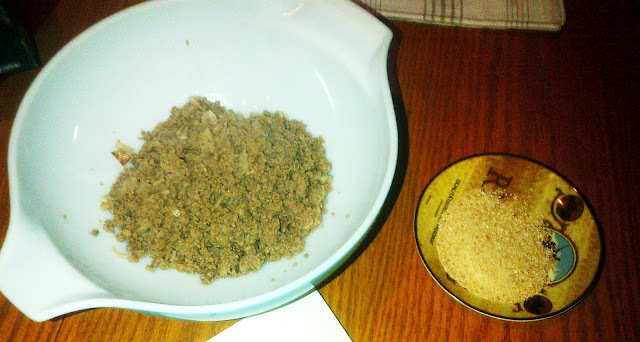 - Pat meat dry, then liberally apply rub to meat and press on. Seal in a zipper bag and leave in fridge for at least 24 hours (48 is better). You can also apply a layer or mustard or syrup to help the rub stick to the meat. I never find it necessary, but many BBQ gurus swear by this. - Two days later, remove meat from the fridge and let warm to room temperature. Next, there's a step that I took for the smoked meat that I didn't use for the Texas Brisket, which was to soak the meat in cold water for a couple of hours in order to remove a lot of the saltiness. I would recommend this step with the Texas Brisket, but only giving it a quick rinse or a 15-20 minute soak and then patting thoroughly dry. - Whisk everything together thoroughly and apply to meat with a basting brush every 30 minutes. When you get 4.5-5 hours in, it's time to wrap the meat in foil, adding any remaining mop to the foil package. Smoke for another 3-3.5 hours at 225. Unwrap and smoke at 250 for 30-60 minutes. Let meat rest for at least 30 minutes once removed from smoker. Now, you'll probably be chomping at the bit to chomp at the brisket, so slice off a piece and give it a taste. If it turned out the same way mine did, you might find it just a teeny bit tough. Delicious, but I wouldn't eat it dry. So, my technique is to chop or slice pieces of brisket (about 1/2 cm thick) and simmer them in sauce for about 10-15 minutes on medium-low heat. Once you've done that, you should have melty, meaty, saucy perfection. Now, I'm a big fan of homemade BBQ sauce, I just find it is way more interesting (and tasty!) than store-bought stuff. In keeping with the "KA-POW! BRISKET!" flavour profile, I whipped together a sauce with lots of deep, rich-tasting ingredients like coffee porter, molasses and berries paired with high notes from ginger and lime juice. - Heat oil and saute garlic and ginger. - Add all ingredients from berries to brown sugar and stir well together. Reduce heat to medium-low (4). Simmer sauce for 20-30 minutes, until it thickens (you may have to simmer longer). - Stir in molasses, honey and lime juice and cook for another 5-10 minutes. 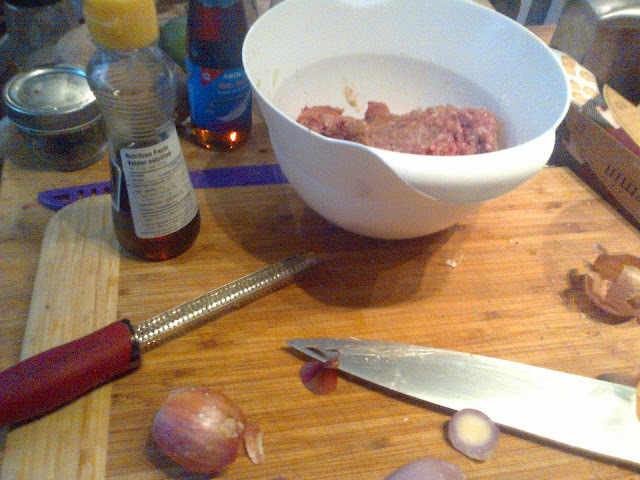 - Put chopped/sliced meat in sauce (ratio of sauce to meat is up to you, but you want that meat SAUCY!) and heat for 10-15 minutes on medium heat, allowing to sauce is bubble for a while. Let the giant meatfesting begin! Serve with whatever sides you think work, but a little research told me that potatoes and green beans are traditional sides in Texas, so that's how I served it in the first go, as you can see above. Final verdict? REALLY tasty, but just a bit too salty. Hence why you should soak the meat a little in water before smoking. I had leftover brisket and gave it a soak before using it in a batch of chili. All I can say to that is YEAH! Brisket Chili, b*tches! So, all in all, an interesting experiment that mostly turned out the way I wanted it to. I give it an 8 out of 10. That's it for our brisket tour of Texas, next time we head to Montreal to find out which brisket is best! November is Native American Heritage Month in the U.S. and a friend of mine posted an item on her Facebook about the 3rd to the 9th being Indigenous Eating Week. This got me thinking about how little is generally known about the cuisine of the Indigenous peoples of Turtle Island (aka North America). So far as I know, there's only ever been one restaurant in Ottawa that specialized in Aboriginal food and that was Sweetgrass, which closed down many moons ago (but they did serve some pretty amazing grub when they were around). It's not like there's a ton of Aboriginal cookbooks out there either. All in all, it's a cooking culture that doesn't get nearly enough airtime, which is too bad, because the staples of many traditional First Nations diets are pretty damned tasty and versatile. Also consider this: the spice in Mexican cuisine didn't come from Spain, maple syrup wasn't invented by Europeans and blueberry pie would be pretty boring if Indigenous peoples didn't first cultivate that tasty little fruit. These are only a few of the culinary contributions from North America's Natives that are mainstays in modern eating, and yet we only tend to know about bannock, jerky and smoked salmon. One of the dietary and agricultural mainstays across the North American continent is/are the "Three Sisters", which are squash, corn and beans. These crops would be grown together in a kind of symbiosis (the beans climb on corn stalks, the squash grows on the ground to keep weeds from growing, etc.) and eaten together would provide a balanced diet. So, upon learning of the existence of Indigenous Eating Week, I figured I should try my hand at putting together something tasty based on the Three Sisters. Now, it's me and I rarely do vegetarian, so I needed something in the meat department that was distinctly Aboriginal. The answer was pretty clear: it doesn't get much more Aboriginal than bison and luckily my butcher carries it on a regular basis (it ain't cheap, though). It being November, the logical choice was to throw everything together into a stew. 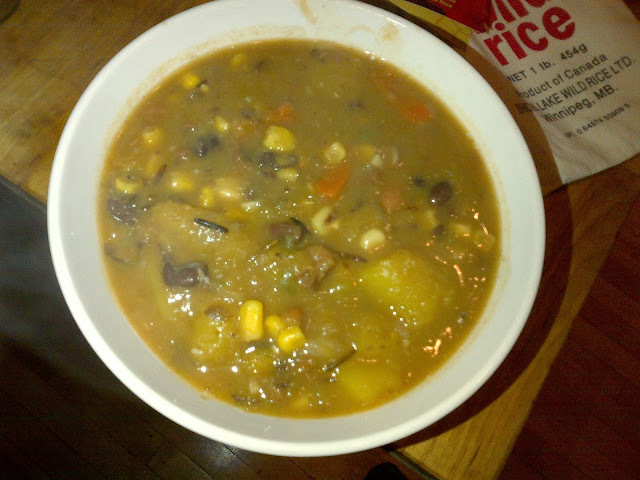 Now, squash, corn and beans are pretty easy to put together in a pot, but that wasn't enough to complete the stew; I'd also need tomato, garlic and onion to round out the flavours. I thought including tomato would have been "breaking the rules" but it turns out tomatoes originated in Mexico long before Europeans showed up. Onions and garlic, not so much, but they're pretty much a staple in everything I cook. Wild garlic (ramps) are native to North America so far as I can tell, but their season is Spring, so no luck there. I also needed something in which to sauté the onions and garlic and went with olive oil as I usually do. So, I did cheat just a little. As I was building the recipe, I thought of other ingredients that originated in North America that would help build flavour. I came up with maple syrup and wild rice, as well as jalapeno peppers for a bit of extra zip and heat. I also went with assertive seasonings, just to make sure it was tasty! - In a large pot, heat oil on medium-high (6-7) and sauté onions and garlic for about 5 minutes. - Add bison and chili powder and brown meat for another 5 minutes. 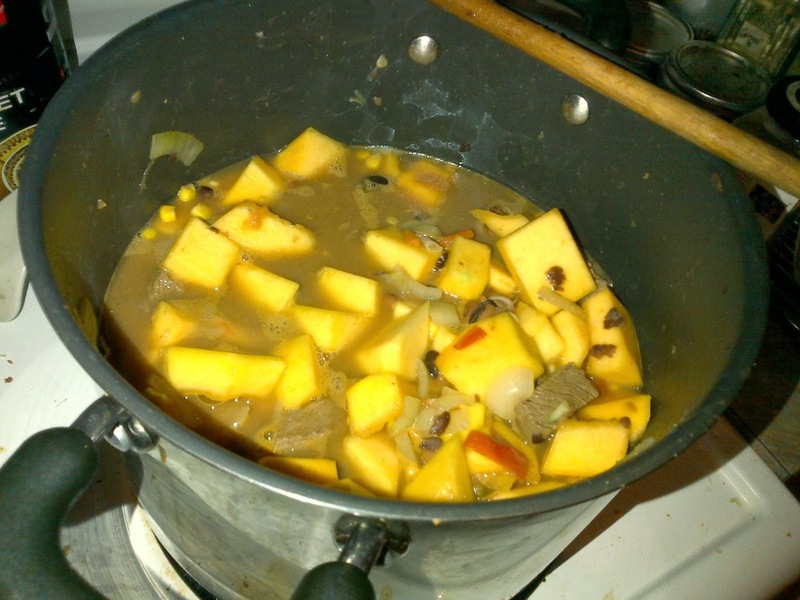 - Add squash, corn, beans, peppers, tomato and stock. Stir thoroughly and bring to a boil. - Stir in wild rice and seasonings. Reduce heat to low (2-3) and cover. - Simmer for 50-60 minutes. Stir in maple syrup. - Simmer for another 10 minutes and serve. I skipped serving with bread or other starch since there was more than enough density and richness to this dish all on its own, what with two kinds of beans and super-lean yet super-dense and flavourful bison all playing together. The squash thickened it nicely, so it was definitely the right consistency, neither soup nor paste. The flavour profile was subtle but really nice. 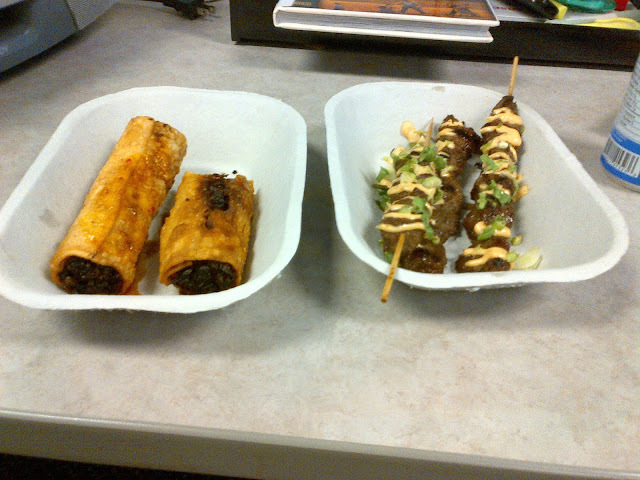 The flavours of the corn, bison and wild rice stood out the most, with just a bit of heat from the jalapenos. There were also some understated southwestern flavours coming from the chili powder and smoked paprika, while the nutmeg, maple and squash evoked the familiar autumnal pumpkin pie flavour profile. All in all, I think it did a good job of showing off ingredients and flavours from all across Turtle Island. So, here's hoping that you take the time to explore some of the most overlooked (and tastiest) food on/from this continent. I doubt you'll regret it! 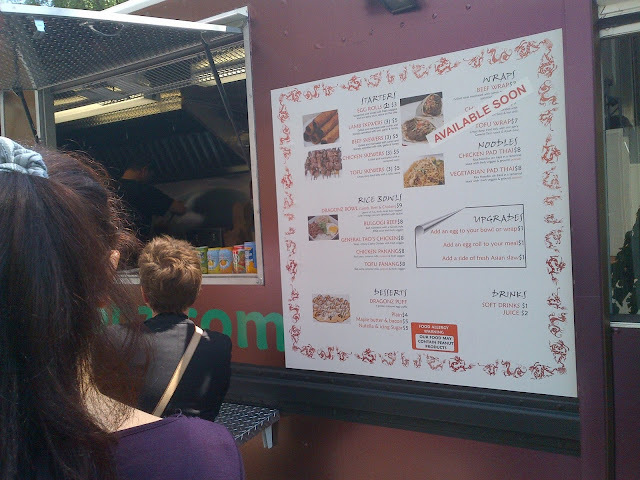 As Ottawa's fledgling romance with food trucks and carts continues throughout 2013, I've had a chance to try a few more of them (although I end up back at Angry Dragonz a whole lot, it being 3 blocks from my house). One place that has stood out in my travels in food quality, and being a neat experience in general, was the Urban Cowboy "Texas Street Food" truck. A long time ago, I worked at Big Daddy's Crab Shack and Oyster Bar, which was one of the first places to serve Cajun food in Canada. It was owned by former Ottawa Rough Rider (CFL football team) Val Belcher, who also started the Lone Star restaurant chain. Val unfortunately passed away in 2010, but his tradition of bringing the tastes of the South to Ottawa is being carried on by his son Layne and his business partner Matthew Hinds via the Urban Cowboy Food Truck. 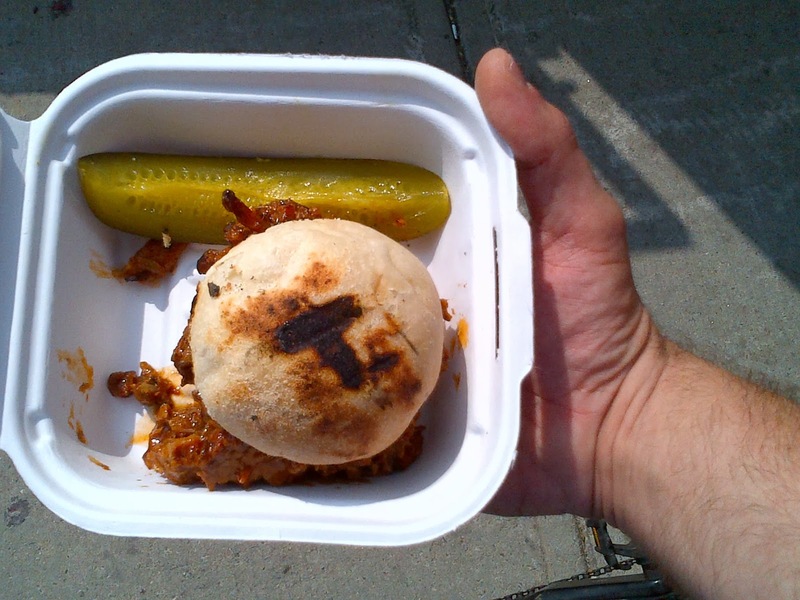 Located in Old Ottawa South at the corner of Bank St. and Glen Ave., they offer all kinds of tasty goodness like ribs, oyster po' boys, portabello sandwiches, sweet potato fries and more. But, having only had the chance to sample their wares once (so far), I had to go with the menu item dripping in tradition (and sauce): the Belcher Burger. The Belcher Burger is about halfway in size between a slider and a full-on burger. At 6 bucks, it's an affordable and magnificent slice of Texas, comprised of a whack of saucy smoked beef brisket on a potato bun with a dill pickle spear on the side. It's simple, but sublime: the brisket is smokey and rich with just the right tangy counterbalance from the sauce and pickle, and is melt-in-your mouth tender (which is a feat to be proud of with brisket). The potato bun is a little more solid than your standard burger bun, which added a nice chewy quality to the bite. All in all, just freakin' awesome. 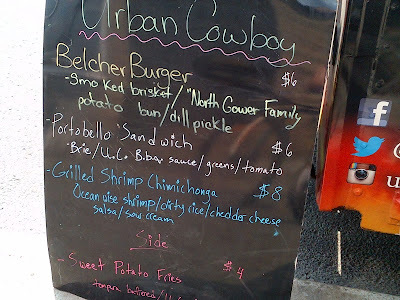 The Belcher Burger is just the beginning! Also awesome was chatting Layne up to get the story behind the Belcher Burger: Back in the day when Val was a linebacker for the Riders in the late 70s/early 80s, he and his wife would whip up brisket burgers for the tailgate parties and later sell them at the games (apparently there was quite the demand, unsurprisingly). 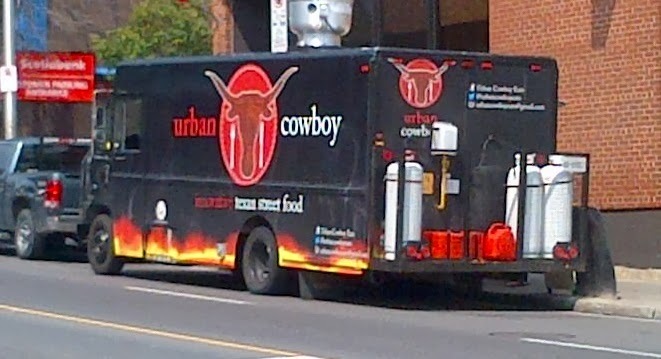 So, quite a fun little Ottawa tradition being kept alive at the Urban Cowboy truck. I can't wait til circumstances send me back their way! I'll be back soon with another truck or two! OK, it's no secret that I am a giant meat eater and eat probably way more than I should. There are a lot of brilliantly delicious ways to prepare all kinds of meats, but there's one that is universal, functional and almost always delicious and that's a friend the world round: the sausage. What defines sausage? Well, according to Oxford, a sausage is: an item of food in the form of a cylindrical length of minced pork or other meat encased in a skin, typically sold raw to be grilled or fried before eating. Simple enough, eh? And yet, there's pretty much no food item that has more varieties in all manners of cuisine than the sausage. I recently borrowed the following book from the library and it maps out the various types of sausage and regions where they can be found and it's pretty much everywhere worldwide except maybe Antartica and Nauru. Just take a look at what wikipedia has to say. Boasting a versatility like few other ingredients, sausage can be used in all manner of recipes and adds a whole lot of flavour with small amounts, which is good since there's probably no such thing as a "healthy" sausage. Lately I've been using all manner of sausage in different recipes and as a result, I have all kinds of posts in the offing revolving around tasty sausage-based creations. In this first post, I'll be looking at the Andouille sausage. Andouille is originally a French creation, but has since come to prominence in Cajun cooking, where it features heavily in many dishes. Andouille is a smoked pork sausage seasoned with wine, garlic and spices (sage, thyme and cayenne usually feature prominently). You'll find Andouille in Gumbo, sausage gravy, pasta dishes and so on. Perhaps the most famous dish that makes use of Andouille, other than Gumbo, is Jambalaya. Jambalaya is a rice dish laden with Andouille, chicken and shrimp, as well as a whack of veggies and seasoning. As you may already know, Cajuns don't skimp on flavour when they cook and that is certainly evident in a heaping bowl of Jambalaya. - In a pot, heat oil to medium-high. Cook chicken pieces and sausage for about 5 minutes, then add onions, peppers, celery, garlic and tomato paste. - Cook veggies and tomato paste for about 5-6 minutes, allowing the paste to darken, but not burn. - Stir in tomatoes and sauté for 2 minutes. - Stir in chicken stock, seasonings and rice. Reduce heat to medium-low (3 or 4). - Cover pot and cook for 25-30 minutes, allowing rice to absorb liquid. - Stir in shrimp and cook uncovered for another 10 minutes on medium-low until shrimp is fully cooked through, but not tough. Keep stirring to prevent rice from sticking to bottom of pot. NOTE: you can simply pan fry the shrimp in a little bit of olive oil and stir in to the cooked jambalaya as well. - Discard bay leaves and serve, keeping a bottle of your favourite hot sauce on the side, just in case you want that extra kick. You can serve the Jambalaya with whatever you want (salad, bread, etc. ), but I find just a good sized bowl is more than enough of a meal on its own. The verdict is very simple: This is one of the only rice dishes I truly enjoy making. It's simple, hard to screw up and just exploding with rich, deep flavour, especially from the Andouille. I'd made it previously with Italian sausage and it just wasn't the same. I recommend trying this recipe at the first chance you get, you won't regret it. So, that's the first look into the wide world of sausage. From the kitchens of New Orleans, we'll next be travelling across the Atlantic. But where to? Well, stay tuned to find out! As a denizen of and worker in Ottawa's downtown core, I have a fairly unique perspective on lunch, specifically finding the jewels in a crowded field (of course, there are probably hundreds of people who work in my area who feel that way). Now, logically, I assume that lunch is the meal most eaten and prepared outside the home. While many folks are assiduous with their use of lunchrooms and thermos bags, the sheer volume of people eating out at lunch, especially in the heart of Canada's public service district, is amazing. There are literally dozens of shops that exist and are open only to correspond with the lunch hour. The problem is that a LOT of them are either chains like Subway or Tim Horton's or serve somewhat uninspired, albeit somewhat satisfactory, food. If you've ever eaten at the Esplanade Laurier food court, you might get my point (although the Greek place makes a kickass moussaka). So in this post I'm going to share some of my discoveries! Note: The noontime feeding scenario has changed a bit since the advent of new food trucks and carts, as I've discussed in this post. Yeah, yeah. You'd think that with all the props I give these guys, I'm on the payroll or something, but they really are one of the better purveyors of lunch time fare. Their pizza is very tasty, all vegetarian fare with toppings like fresh mushrooms, roast garlic, cherry tomatoes, kalamata olives, sliced fresh jalapeno and many, many more, with cheeses ranging from good 'ol mozzarella to ricotta to gouda to feta. They even offer a vegan pizza that uses kale instead of cheese! They do soup, but I've never partaken. They have a pretty taste range of salad as well, but the big selling point for me is the pizza and their sandwiches, specifically their Avocado Sandwich. It got voted best cheap sandwich in the city on one Web site and I'm a big fan. Avocado slices, red onion, cilantro, tomato, lettuce, sunflower seeds and a touch of balsamic vinegar all served on organic sourdough bread. It's about as fulfilling a sandwich as it gets in vegetarian circles. 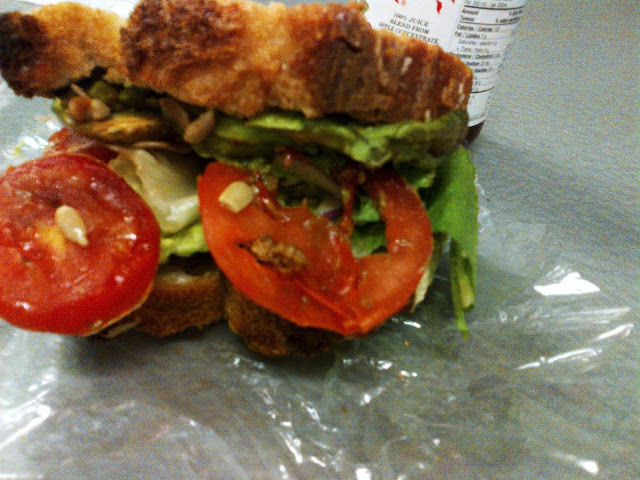 The King of veggie sammiches! It's good to know that there's still a throwback or two in the vast field of lunch providers. The German Town Deli is about as throwbacky as it gets! We're talking simple and cheap. This is probably the last place in town you can get a sandwich for under 2 bucks. Granted it's just meat and bread, but it's a good amount of meat, the bread's always fresh (and they use Rideau Bakery rye, which is pretty much the king of all breads) and they provide packets of mustard for free! What else do you need? Oh well, maybe a Landjager... They also make a ripping lentil soup (thankfully, *with* big hunks of pork in it)! The latest offering for me was a Bavarian meatloaf sandwich "all-dressed" (meaning lettuce, tomato and mayo) for 3 bucks. Not too shabby considering Subway would be at least twice that much. All in all, the value for money is one of the main reasons I love this place. 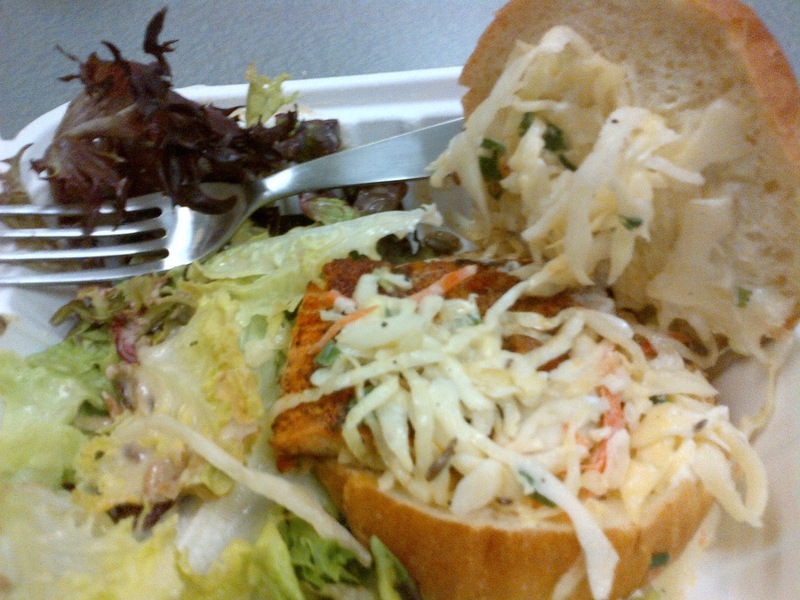 It's rare to find really amazing food offered in a mall food court, but that is exactly what happens every weekday at the World Exchange Centre at lunchtime. At a little sandwich counter, a gentleman named Claudio, better known as "The Soup Guy" whips up some of the most delicious and interesting soups this city, maybe even this world, has ever seen. Don't believe me? Well, I lay the gauntlet at your feet. In the few times I've been, I've had classics like gumbo and a cream of chicken variation, but it's the Soup Guy's inventiveness that really makes the food special. Just the other day he was serving up a roasted red pepper based soup with papaya, mango and pear. Crazypants! A Bowl of "Island Breeze"
But the REAL masterpiece is his Philly Cheesesteak Soup. It tastes just like the sandwich, but in soup form. If you never believed a bowl of soup could be a meal unto itself, this will likely change your mind. Unfortunately, it's not always in the rotation, but keep an eye out for it! Well, that's about it for this post on lunch. I'm sure like any good tale, it'll have a sequel. Hey kids, I'm back and super-excited about this post! Ottawa has a poorly earned reputation for being the "town that fun forgot". I happen to know better, mainly because I hang out at the Dominion Tavern, as do some of the city's most creative people. But even though our arts, music and many other communities are small and somewhat overlooked, there is one area in which our town has a pretty strong following and community, and that's our food. Even though we might get overlooked in guides and "top 50 lists", Ottawa has a strong foodie culture (might have something to do with all those public servants and their disposable incomes). 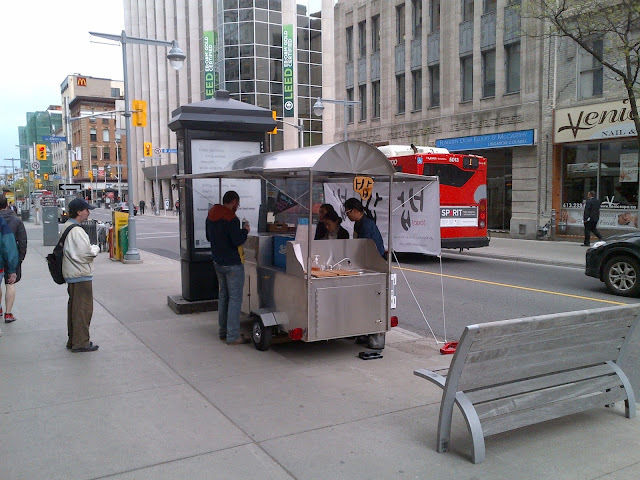 But up until recently, one thing had been missing to make Ottawa's food scene really exciting: a decent fleet of street food trucks and carts. For decades we were saddled with chip wagons and hot dog carts and almost nothing else (with some exceptions like Stone Soup Foodworks). Maybe this was a concerted effort by city authorities (who may, in fact, be the ones who want to keep the fun out of Ottawa) to prevent the city from developing a street food presence, or maybe the suburban mindset has taken over so deeply that Montana's is somehow considered the apex of good food... who knows? 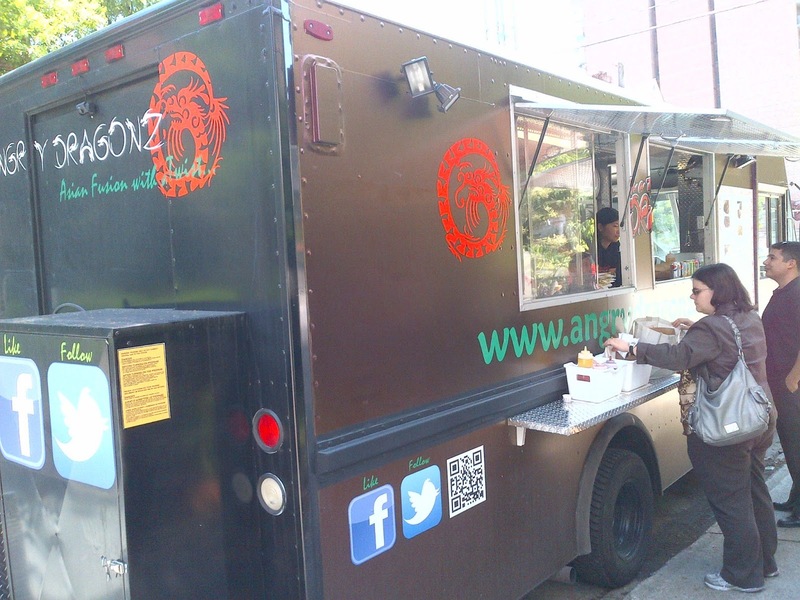 Luckily, city council eventually saw the light and as of May 2013, a whole slew of new and interesting food trucks and carts have come out of the woodwork. I'm doubly excited since one of my professional fantasies is to open my own food truck some day. At least the legal obstacles have shrunk! I've managed to try out a few of the new spots, but there are many more to peruse. So, in this post, I'll cover the first three with more to come in the coming weeks. So, in order of when I tried them, we have Raon Kitchen, Ottawa Streat Gourmet and Angry Dragonz. Let's get at 'er! There’s something to be said for doing one thing and doing it really well. 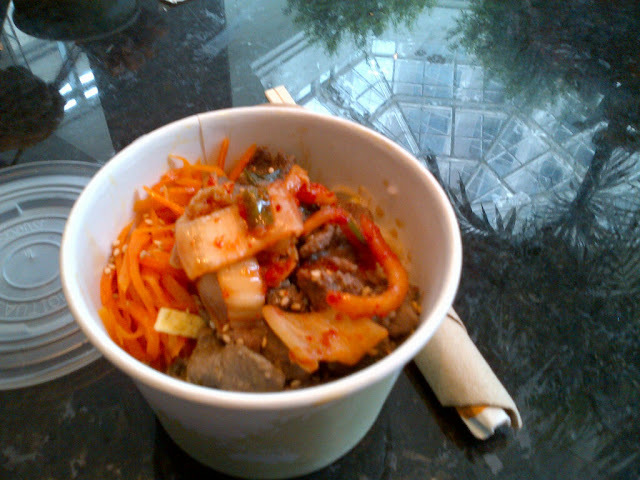 This is very much the case with one of the first entities in the great Ottawa Street Food Revival of 2013, Raon Kitchen. This simple little food cart located on Bank Street between Slater and Albert streets (conveniently around the corner from my office) serves the Korean dish Bibimbap, which is essentially a mix of rice, meat and veg. Kari and I got to give it a try on their second day and it was AMAZEBALLS!!! The dish comes with seasoned rice (I think they use rice vinegar in it), mixed veggies, your choice of beef, chicken and tofu, egg and is served with a small container of homemade kimchee. It was a fantastic mix of salty, sour, sweet and spicy. The portion isn’t huge for 7 bucks compared to some of the cheaper, greasier selections available in downtown Ottawa (which is ridiculously packed with lunch places), but I think it’s a quality meal for the price. I was more than satisfied after devouring every last morsel. All kinds of goodness going on! I have some aversion to the idea of clever puns in business names, but to each their own! 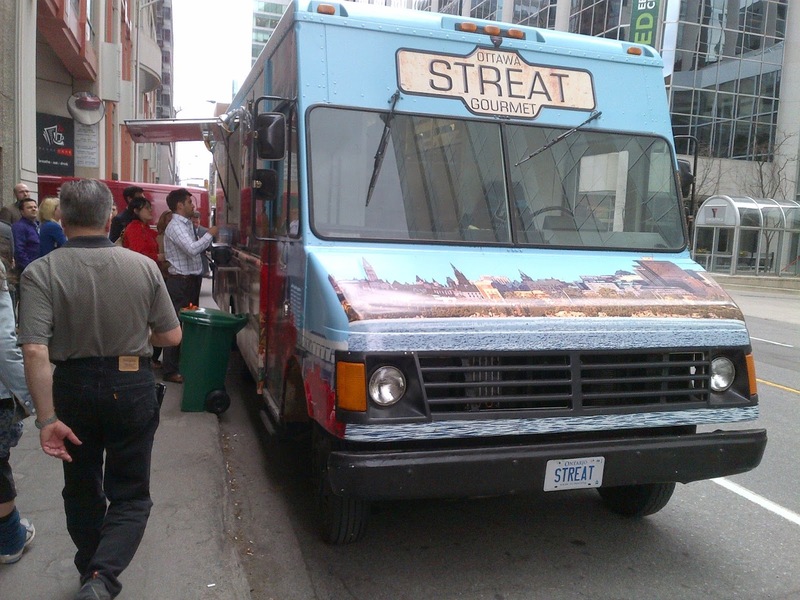 Streat Gourmet (Str"eat", get it?) is a truck focused on fresh, tasty goodness. It's set up on the corner of O'Connor and Queen, so it's fairly busy during the week. On the day I went by (early June), the menu consisted of a Brie in Phyllo Pastry for 10 bucks and a Blackened Trout Sandwich with Slaw and Lemon Mayo for 12 bucks. Both came with a green salad on the side. Not one to resist either fish or blackening, I went with the trout sandwich. My impressions were a bit mixed: In the sandwich's case, the fish was perfectly tender and flavourful (albeit the piece was a bit small), but it wasn't even close to blackened, more like bronzed. It wasn't spicy at all and there was no crust from searing spices onto the meat, which is what blackening is! The bun was fresh and tasty and slightly chewy, which was a bonus. The mayo was very low key and could have used a bit more zing and the slaw wasn't really all that interesting. As for the side salad, the green goddess dressing on it was superb, creamy and garlicky, but it was only greens. A few other veggies would have been nice. Streat Gourmet is kind of the opposite of Raon Kitchen in that the menu is ever-changing, so I may have to give it another shot soon. Angry Dragonz is a truck that, God help me, is about a 5 minute walk from my house. They serve what they call "Asian fusion", I call it damn good! That's a spiffy lookin' vehicle! These cats are ambitious as heck, boasting a menu of over a dozen different items, with more in the works! I've been about five times now (proximity to home is a big incentive) and I'm amazed at how friendly, energetically and efficiently the staff works in such a small space, with three people milling about making egg rolls, tasty skewers, epic rice and noodle dishes, and crispy golden egg batter waffles. - Egg Rolls: Egg rolls are one of those things that are best when you don't mess with them. After all, why change a classic. With that in mind, the Egg Rolls at Angry Dragonz are classic American-Chinese style done really, really well. I usually get them whenever I'm there. You can get a pair for 3 bucks or add one to your rice or noodle bowl for a buck. - Lamb Skewers: I can't rave enough about these. I bought them on my first visit after getting there a bit late and discovering all their rice had sold out. So, I figured I'd try the Lamb Skewers on a lark. Wow. Just wow. These things are meaty perfection. The lamb doesn't taste too "lamby" and it's marinated in a cumin-based marinade, then topped with honey, chili and some kind of saucy deliciousness. It is out of this world. Mind you, that's just my opinion because Kari wasn't as big a fan of the cumin-centric flavour (which is also how they season their beef skewers). 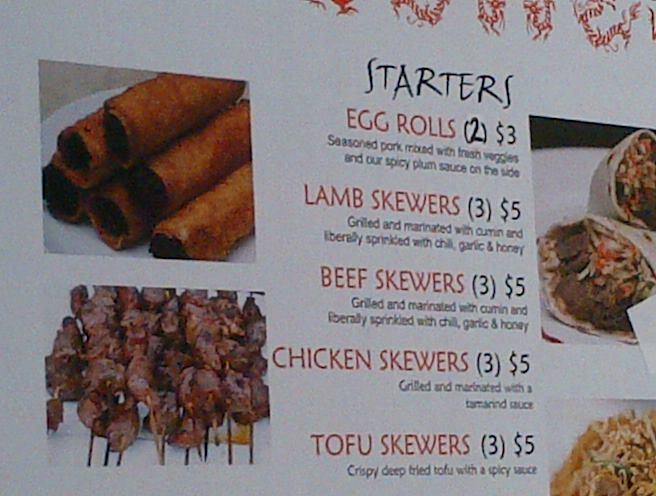 They also offer chicken and tofu skewers, all of them being sold at 3 skewers for 5 bucks. - Chicken Panang: This dish was my first non-epic-win. 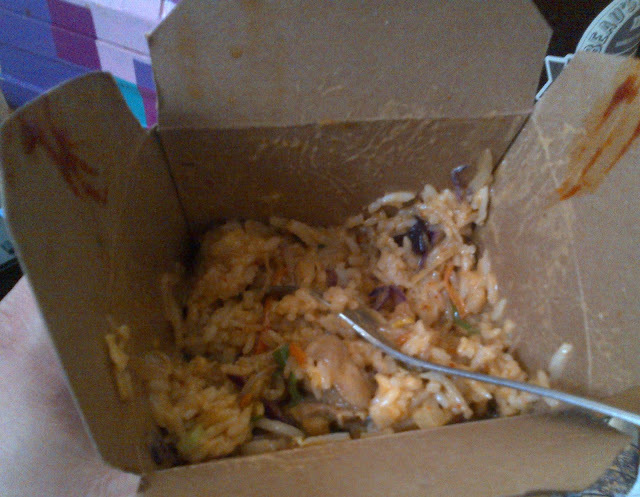 It was a rice dish topped with, essentially, a Thai style red curry with chicken and coconut milk. Don't get me wrong, it was delicious, but it was also pretty damn spicy! Like, way more spicy than most red curries, including my own recipe. Maybe I'm a wimp, but the level of heat made it hard to scarf down. Yes I'm using a fork, sue me. So, those are a few of the initial samplings from Angry Dragonz (I've had more since). Of the three trucks/carts mentioned in this post, they're by far my favourite, but that might be based on a geographic bias and variety. All in all, so far so good in the genesis of the Ottawa food truck scene, at least from my perspective. I'm looking forward to exploring all of them around the city. Any excuse for a bike ride, right?